Top 10 Fashion Designers of India. Indian fashion industry is growing rapidly around the world, so far many people do not know about those who are actually providing new heights to the industry. Although there is no shortage of fashion designers in India today, there are some people who will always be considered as very famous people of the fashion industry. Who are they? 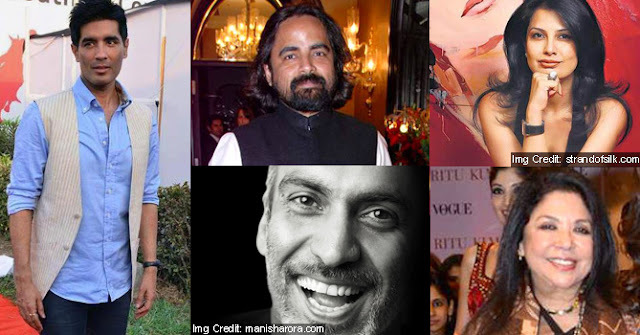 Well, here's a list of top 10 designers who are famous as a successful fashion designer in India. If we talk about the fashion industry, then the first Bollywood fan and veteran fashion designer Manish Malhotra. Manish Malhotra, who started his career with designing costume at the beginning of the age of 25, has given almost all the heroines of Bollywood a wonderful job of designing. In the case of brilliant costumes, this designer, who has a top designer status, named many publications as his name. As a monarch of Costume Designer, famous Manish Malhotra is known for the splendid rhythm and decoration of the bride, which is the desire of every girl. Designed: Shree Devi, Juhi Chawla, Urmila Matondkar, Kareena Kapoor, Deepika Padukone and Alia Bhatt etc. Tarun Tahiliani, who has a great vision to give a great design to the clothes and a great looking about them, is considered as the pioneer of multi-designer boutiques in India. As a famous fashion designer, he gained fame on his subtle ideas with a combination of traditional Indian heritage with European styles. They are mostly known for the collection of bridal accessories. Designed: Katrina Kaif, Diya Mirza, Lisa Hayden, Isha Gupta, Hrithik Roshan, Arjun Kapoor, Madhuri Dixit and Sonam Kapoor etc. 3. Ritu Beri With the glory of India in the international market, Ritu Beri became the first Indian fashion designer to perform a collection in Paris. His style of design and superiority shows a rare meaning of luxury prosperity. Ritu Beri is known for her western clothes and designer sarees, Ritu Beri has also received the highest award from the French government for her incredible work in the field of fashion. Designed: Prince Charles, former US President Bill Clinton, Nicole Kidman, Andy McDowell and many Paris Social Town. Indian customers include Rani Mukherjee, Preity Zinta and Madhuri Dixit. In addition to being a fabulous fashion designer, J.J. She is also the founding member of the Fashion Design Council of India. They are also known for incorporating traditional crafts with artistic fashion. His signature style reflects the beautiful handicraft which tells the basis of his grand collection. Designed: Kareena Kapoor, Hrithik Roshan, Cat Blanchett, Joseph Fiennes etc. By Time Magazine, described as "India's Master of Fabric and Fantasy", Rohit Baal is one of India's most famous fashion designers. Along with proficiency in exquisite detail, Rohit Baal is the master of excellent designs, he has adopted local artwork and design. Designed: Cindy Crawford, Naomi Campbell, Pamela Anderson, Amitabh Bachchan, Deepika Padukone and Aishwarya Rai Bachchan etc. A comprehensive knowledge of art history and musicism made Ritu Kumar a famous figure in the fashion world. Their efforts to revive the traditional craftsmanship have played a major role in creating jobs in undeveloped areas. In addition to your own collection, Ritu Kumar has also designed for Miss World and participants in Miss Asia Pacific. Designed: Cindy Crawford, Naomi Campbell, Pamela Anderson, Amitabh Bachchan, Deepika Padukone, Aishwarya Rai Bachchan etc. Known for his low style of designing, Wendell Rodricks is not only a famous fashion designer but also a fashion journalist. His passion for fashion gave him an important place in the fashion industry. Being the Guardian of Goa, encourages the curiosity of the artists of Goa through special exhibitions. Designed by: Sonam Kapoor, Deepika Padukone, Rekha and Evelyn Sharma etc. One of the most talented designers of the Indian fashion industry, Sabyasachi Mukherjee is known for bridal collection. Their designs have a glimpse of the ancient and medieval era. The originality of the designs is the basis of their specialty. He is also the only designer to be invited to Milan Fashion Week to showcase his collection. Designed: Aishwarya Rai, Vidya Balan, Neha Dhupia and Gujarsish, Babul, English Winglish, Pa etc. in the movies. In addition to designing some of Bollywood's biggest celebrities, Vikram Phadnis has also presented himself as a celebrity stylist. His collection includes bridal garments as well as pret-a-porter clothes. Vikram Phadnis has beautified the fashion industry with his elegant work and style in his 15 year career. Designed: Karishma Kapoor, Soha Ali Khan, Ayesha Shoa, Malaika Arora Khan etc. Another famous name of the fashion industry, Manish Arora launched its label in 1997. They are known for their use of vibrant colors and some flamboyant offers which they have made in their collections. Designed: Lady Gaga, Rihanna, Katy Perry, Britney Spears, Sonam Kapoor, Kangana Ranawat etc.